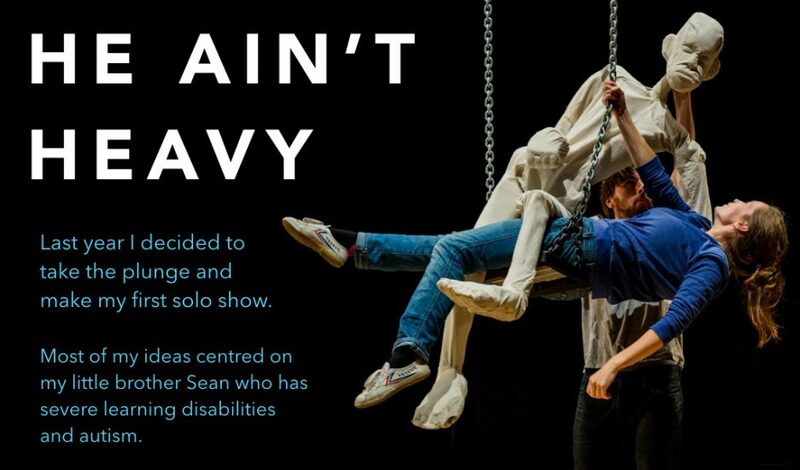 Oddly Moving are seeking a circus performer specialising in contortion and/or hand balancing to work with us in the Research & Development of our new show ‘Weight.’ We are especially interested in BAME performers. Oddly Moving tell stories on the outskirts of normal using circus, physical theatre and storytelling. ‘Weight’ is our second show following a U.K. tour of ‘He Ain’t Heavy.’ It is directed by Charlotte Mooney and produced by Turtle Key Arts. ‘Weight’ will retell the Greek myth of Atlas carrying the world, and reflect on themes of responsibility, choice, physical and emotional weight. In this R&D we will experiment with different ways of navigating a set made of suspended and ground based objects of various sizes/weights and explore different ways of using circus to tell the story of Atlas. We are looking for a performer whose primary skill is either contortion or hand balancing, someone who is excited by devising new work, comfortable using text on stage and interested in using their own autobiographical material relating to the themes. If you are interested please send a brief expression of interest and any links to examples of your work to oddlymovingcircus@gmail.comby Monday 4thMarch 2019. All aged 18+ are welcome to apply, if required, please include any additional access requirements so we can facilitate. ‘Weight’ will explore the Greek myth of Atlas carrying the world, and reflect on themes of responsibility, choice, physical and emotional weight. In this R&D we will create a set made of suspended and ground based objects of various sizes/weights and experiment with different ways of navigating this landscape whilst telling the story of Atlas. We are looking for an object manipulator who is excited by experimenting with unusual objects and comfortable talking on stage and using autobiographical material. If you are interested please send a brief expression of interest and any links to examples of your work to oddlymovingcircus@gmail.comby 19th December. Please include any additional access requirements. Here’s where we’re at; We have had amazing support from the Arts Council and many others and we’re incredibly chuffed to have been on a U.K. wide tour and to have received such a lovely reception. In 2019 we will be creating Oddly Moving’s second show and putting HAH out to pasture, to have a well earned rest, only to be brought out for special occasions. This means we can’t guarantee what will happen next for HAH, so if you have been meaning to come along and it hasn’t worked out yet then this is the time! We also have a very special cameo appearance from Francesca Dunford, who is stepping in for Sophie for this show. Without us knowing before asking her to join us, she has previously trained in aikido and can do a mean ‘twisty-arm-restriction-thing.’ So if you would like to see the show and see Chez effortlessly take me down and visit the lovely town of Chichester then… THIS IS THE TIME. We spent the following day doing circus workshops in Barnsley College with their Learning for Living and Work students, where we had the pleasure of meeting a lot of amazing people! Everyone learnt poi, diablo, juggling balls and scarves, and spinning plates, with some very joyous inventions. We hope to come back again soon. Whilst I wouldn’t usually share my holiday snaps here (that’s what Instgram’s for), Soph and I had a couple of hours exploring the Yorkshire Sculpture Park before moving on to our next tour destination. It was uplifting to walk through the autumnal trees finding sculptures along the way, whilst indulgently sharing my nostalgia for Bretton Hall. There is still time to catch He Ain’t Heavy this year and Up North as we will be performing at The Waterside in Sale this Saturday. As a new company with our first show it really helps us if you can spread the word, so please spread far and wide! AUTUMN 2018 UK TOUR – Spread the word! For three years now Jimmy has been guiding me through the trials and joys of devising autobiographical text. It seems ironic but the hardest challenge has been authenticity; how to recreate the honest kernel of a sentence that has been said for the 50th time and remembering why I said it in the first place. I can see it from the outside; I can see the sections that don’t always land, the importance of drive, changes of pace and crafting the text. From the inside I feel a hotbed of conflicting emotions that have to be allowed to exist but cannot always colour the text. For Sophie and I to be entirely present with the audience, which is what we are aiming for, means holding both these intellectual and emotional states at once. This is what we have been sharing with our audiences over our summer tour. We’ve come a long way since I enacted the first time I remember my brother having a fit in the middle of a shop. I remember feeling entirely exposed and upset in a way that I hadn’t allowed myself to be when it had happened. This is now part of the meat and the bones of the story, and even on the days when I struggle to find the craft the story tells itself. I’ve metaphorically shut the van door on this stage of the tour, waved goodbye to Sophie and Callum and moved on to new challenges, but I can’t get the show out of my head. I’d like to do it better. As Jeanette Winterson might say, I’d like to tell the story again. Luckily we can, as we continue our tour in the autumn – we’d love to see you there! An incredible performance from the heart, loved every second! Absolutely stunning beautiful portrayal of what it is to love someone with severe autism. Beautiful. What a beautiful, authentic, sharing so creatively thoughtful & real. I am deeply touched & moved. Thankyou for the relaxed performance which allowed my son to come in and out and be himself. Thank you for this moving piece of work – such warmth, generosity, depth of feeling, informality, border crossing combined with precision and grace. Visually and emotionally powerful. Makes me think about sibling relationships and how important they are. As you can see from these photos, taken by Eleanor Postlethwaite, Sophie and I had a lot of fun performing He Ain’t Heavy last year! We had some amazing experiences everywhere we went, meeting brilliant people at every venue, in the audience and in the workshops. One of my favourite moments (of many) was when we invited some younger audience members to join us on stage for the wedding at Jacksons Lane and one lad made a bee-line for Sophie’s guitar, she reacted with gold comedy timing announcing to the audience that luckily the wedding musician had just arrived! This was a particularly exciting relaxed performance as it was the first one that Jacksons Lane had hosted. We had a great time running theatre and circus workshops for a wide range of people across the country. Disguised in the picture below, amongst the audience volunteers, are some members of Skylight Youth’s Circus who were up for some experimental circus-theatre creation in the workshop following the performance. I’m glad to say that the experiment led to some fabulously creative results and we hope to add some more elements to the process pot to see what we can make this year. If you’re wondering what’s next for Oddly Moving and He Ain’t Heavy, then I can confirm that plans are afoot and further tour dates will be announced a little later in the year! If you haven’t seen the show and would like to watch a trailer then there is a video at the end of Turtle Key Art’s Oddly Moving page. In the meantime please get in touch if you’d like to have a chat or for more information; we can now be contacted via email oddlymovingcircus@gmail.com, or Facebook or Twitter or Instagram!